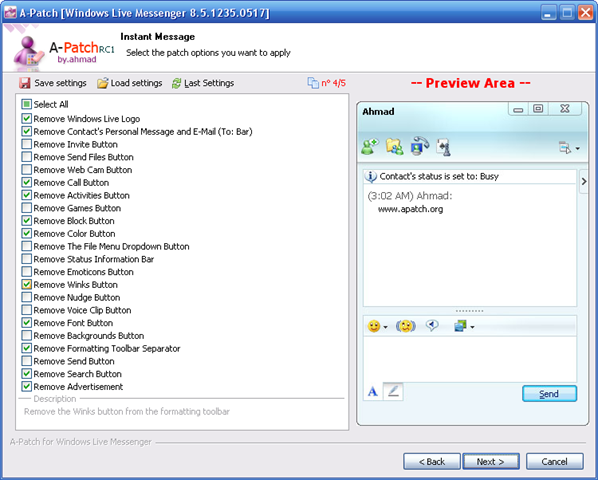 For years I’ve used Mess Patch to customize Windows Messenger and it’s done a decent job. My main problem with the program was that some of the customizations were not explained well and one had to be a Messenger power user in order to understand some of the feature descriptions. But it was the only product I knew that would remove ads so I continued to use it. But a friend recently told me about A-Patch which feels like a more polished version of the Mess Patch. But it has one killer feature: Real time preview. This allows you to see how your selections will look before making any changes to Messenger. The first chat program I installed (not including MIRC) was ICQ and I loved it until it become a bloated piece of junk. I moved to Microsoft Messenger because it was small, fast and didn’t include a bunch of useless features. But now the same level of bloat that happened to ICQ is happening to Windows Live Messenger. But with the help of A-Patch you can put Live Messenger on a diet once and for all. A few coworkers use Meebo and like it. I’ll give it a try. Any opportunity I have to get rid of another installed application is a good one. I assume it stores my contacts the way MSN does so I don’t have to add them all again?